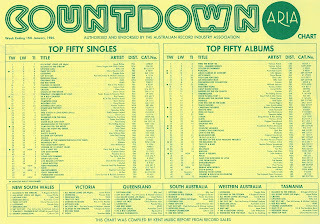 Music acts can pretty much be divided into innovators and imitators, and as our look back at the ARIA charts from years past finally reaches 1984, we're going to see plenty of both. In fact, the very first chart for 1984 features a new entry by a band whose music and image have been incredibly influential, even if the group themselves weren't ever the biggest of chart stars. The biggest chart star in Australia this week in 1984 was still Lionel Richie, who remained at number 1 with "All Night Long (All Night)". With this chart covering the three-week Christmas shutdown period, the track spent its second, third and fourth weeks on top. Unfortunately for Anne, it was only more bad news as this title track from her 1983 album became her latest single to peak in the 90s. Her biggest hit remained her 1978 number 2, "You Needed Me". Bob Dylan's last two singles to chart in Australia had also peaked in the 90s, so it was a slightly improvement for this track from the Mark Knopfler co-produced Infidels album. What's new? How about a fresh musical direction for the singer last seen on the top 50 in early 1983 with rock ballad "I Knew You When". "What's New" was the title track of Linda's first album with big band legend Nelson Riddle - two more covers collections would follow, but Linda wouldn't return to the chart until she was back making pop in a few years' time. New year, new sound for the band known for the new wave feel of top 10 hits "Promised You A Miracle" and "Glittering Prize". With its throbbing bass and anthemic feel, "Waterfront" was a sign of things to come as Simple Minds transitioned into the stadium rock sound they'd perfect in 1985. Singer Jim Kerr even adopted a less stylised image for the occasion, and the band's fans seemed to respond favourably, with this first single from sixth album Sparkle In The Rain returning Simple Minds to the top 50 after "Someone Somewhere (In Summertime)" was a near miss in early 1983. In my posts covering 1985 and 1986, we've seen some of the many singles by Stephen Cummings that missed the top 50, but here's one that made it! 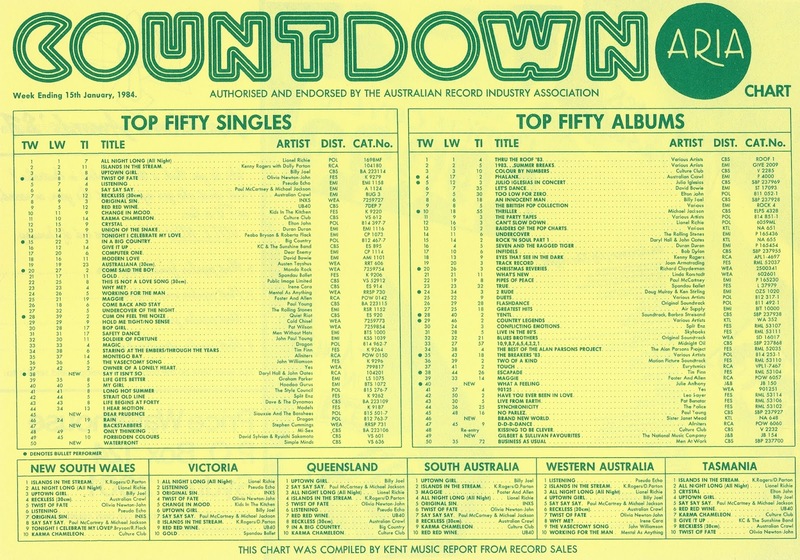 The first hit for the former frontman of The Sports, "Backstabbers" only just scraped into the top 40, but it was more than "We All Make Mistakes" (number 89) or "Stuck On Love" (number 76) had managed in 1983. Critics salute them and other artists adore them, but like many unique acts that carve out new musical terrain, Siouxsie And The Banshees didn't have the most illustrious of chart careers. In fact, this cover of the 1968 album track by The Beatles is one of only three top 50 entries the post-punk, pre-goth band had in Australia between 1979 and 1991. The first - and biggest - was debut single "Hong Kong Garden", which reached number 38, and the other was their big American hit, "Kiss Them For Me". Released between the band's fifth and sixth albums as a stand-alone single, the remake of "Dear Prudence" was actually prompted by sometime member Robert Smith (yes, the one from The Cure), who'd fill in for live performances from time to time but wanted to be involved in an actual recording as well. 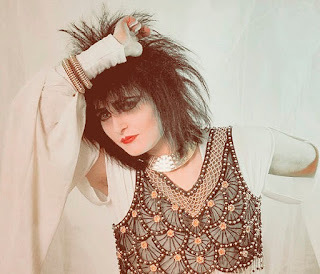 Robert is one of the many artists to have been influenced by the band's incomparable singer, Siouxsie Sioux. With her distinctive vocal delivery, inimitable performance style, cutting-edge fashion sense, left-of-centre songwriting and, of course, her trademark cat's eye makeup, she was like no-one else - either in 1984 or today. From a beloved British band we move now to the most successful American duo of all time. Nothing demonstrated how big Hall & Oates had been in the States than their 1983 greatest hits album, Rock 'n Soul Part 1, which contained no fewer than five Billboard Hot 100 chart-topping singles. New track, the effortlessly catchy "Say It Isn't So", almost became the pair's sixth number 1, held off the top spot for four weeks by "Say Say Say" by Paul McCartney and Michael Jackson. In Australia, "Say It Isn't So" was only a moderate hit and their biggest single here remained "Maneater", which reached number 4 in 1982. Next week: the new year really gets underway with seven new entries, including debuts by a future chart-topper, a much covered and sampled funk track, and a single that was also available to buy as a music video.